Free Video Calls using Fring on iPhone, Android, Symbian Mobile | Free Pc to Phone Calls, Free Voip Calls to India International ! We said in last post that with 3G/Wifi on your Mobile you can make Video Calls, but what's the procedure. We already discussed a few options which offer you free mobile video calls, but we have not discussed how you can actually make these free video calls. 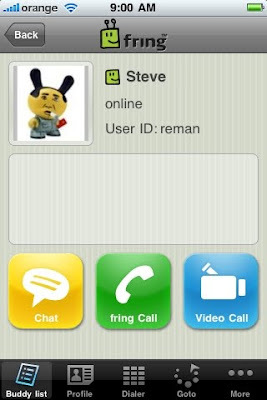 Lets figure out how to make free video calls using Fring on your iPhone, Android, Symbian or any other mobile. 1. You have a smartphone (with secondary camera - front camera) : iPhone, Android Mobile's etc (the phone which fring supports). 2. Your mobile phone is connected to internet with either Wifi/3G connection (high speed internet to support a video call). 1. Download Fring to your iPhone, Android mobile. 2. Register with Fring. Create an account. Add your friend to your buddy list (contact list). 3. Now to call your friend : go to buddy list, click on your friend name. Click the video icon. PS: If you are looking for a cheap voip provider (spl to India) : try out Rebtel! Alternatively check out the Video from Fring : Making Video Call using Fring! Please share with us your feedback. Whether you are now making Free Video Calls using Fring! Trust me guys, Video Calling is just great! Nowadays there are several ways to make free calls to India. You can make free calls on skype or fring but unless the other end of the call is on skype you have to pay hefty per minute costs. I found a new service that allows you to make completely free voip calls. The service is rather simple. It is called CallArc. Go to http://www.callarc.com and register for the service and create contact. Download the iphone app or android or pc application. Get Free credit to make calls. You can get up to $4.00 in credit instantly for free calls. Connect with you iphone or call into the access number and you will be connected to your destination number anywhere in the world. This is one of the great services I have come across recently that is completely free. The service is available world wide. You need the following information to connect to the service. So register for the service and enjoy free international calls. join our calling cards agent service to connect the world. and keep in touch with our merchants services.